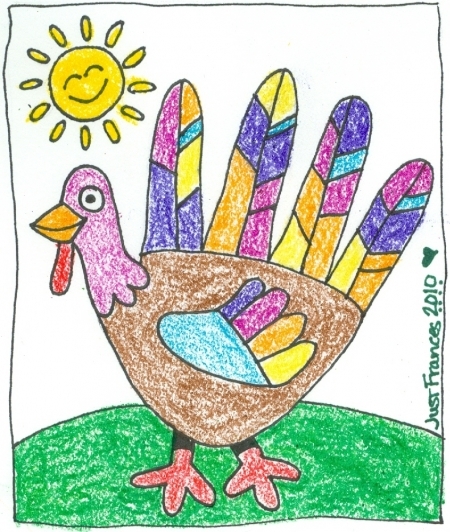 This entry was posted on Thursday, November 22nd, 2012 by Frances Ryan. Today is Thanksgiving and, once again, I have so much to be thankful for. Of course, it’s always a little awkward being overseas on the holiday, since it’s not only not celebrated here, but it’s also not understood. So when my good friend, a primary school teacher, invited me into her classroom to talk with a group of 30+ eight year olds on the topic, I didn’t hesitate to say yes! When I got to the classroom, I was introduced to the children as Mrs Ryan, and was soon swarmed with children wanting to tell me that they’ve been to America or that they know people who’ve been to America. So it was easy to see that I would have a fairly interested audience. Anyhow, the day was spent reading the children a book about the first Thanksgiving and explaining to them who the Pilgrims were. Then we talked about the feast and how similar it is to a Christmas dinner. And then we talked about the important part of the holiday: Being thankful. Soon, the children were back at their desks busily writing down a few sentences about what they were most thankful for. As I watched them write, I knew that I was thankful for being there. I was thankful that I was able to share one of my favourite holidays with a group of eager children. Of course, later I was thankful for my sister-in-law, Liz, and brother-in-law, John, who had travelled up from England to celebrate my graduation tomorrow. And for our Thanksgiving feast? A nice Indian curry at one of my favourite places in Stirling. Yes, I have much to be thankful for.